Okay, more AI, but I’ll stop soon. 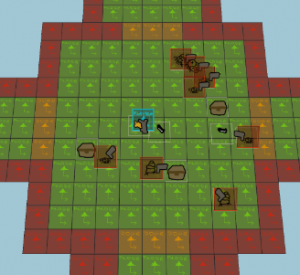 I will also focus on refactoring, cleaning and generally improving my enemy and AI code. (It’s really important that I like the code, otherwise I won’t want to work on it. And “wanting to work” is already really hard to come by.) I need to reach a comfortable place with AI where it’s prototype-showable, even if not “perfect”. Now all desires are always “active”, some just have no chance of being desired at times. And this works pretty much the same as it did before, but with cleaner code and slightly uncleaner -100 scoring. I also had to do some heavy optimization for the desires, as every enemy has this system and they all keep checking everything every frame. Now they check things periodically over multiple frames and cache their results. This happens because enemies don’t realize they can go to the next location on the path. 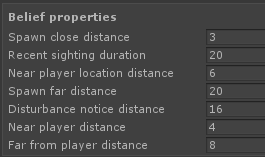 So I added some logic to skip the coordinate if the enemy is already closer to the next one. 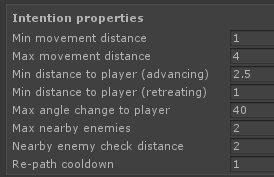 And an additional check if the enemy doesn’t reach a coordinate in a certain time amount, then just stop the pathing altogether. This might cause enemies to do a half-loop and then move on, which is perfectly fine with my “enemies are kind of dumb” design. I also need to work on my enemy player awareness logic. 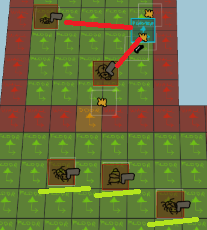 This will solve several other issues with enemies spotting the player too fast or too slow, not being able to get alerted about their buddies in fights, having any sort of debuffs or effects causing awareness loss (or gain), and just generally my code having poor flags instead of a reasonably designed approaches. My whole “can see player” logic would b supplemented by “aware of player”. I can’t realistically GIF all the scenarios I want, because it takes a really long time to set them up and successfully capture. But the end result is fairly nice. Enemies don’t notice the player instantly, but after a small delay. If the player comes really close, the enemies will notice them at once. The keep firing at the player location a brief time after the player leaves their sight. And they seek the player and all that goodness as well as these values simply plug into the belief/desire checks. In short, most of this just “slows” down enemy responses and makes them feel less robotic. A couple guys noticed the player peeking the doorway and went out to find them, then proceeded to attack them. Then other AIs sensed a disturbance and went to check that out, then also joined the fight. This seems to be enough for now, and I can extend the whole disturbances thing later. The one messy thing here is that seek player and wander around is very very similar to the investigate disturbance. So much so that I pretty much cannot tell the difference in-game. Stuff like this usually implies there is a redundancy somewhere. And I think it’s my “wander around” logic that’s redundant here. In fact, I can pretty much get rid of it. 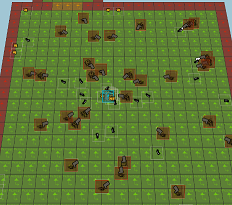 And after some tweaks, I can get the enemies to pretty much act as before if not better. It’s hard to show the difference, but the main thing is that enemies can only notice a fight going on if they are near enough. And if the player moves, they won’t go to the new location unless they actually notice the new fight too. Well, I’ll get back to this at some point, but fatter doors do actually fix like 90% of the issues. Also, looking at my intentions and comparing them to my desires, they are the same exact thing. So I am just going to reuse the same value throughout and simplify the code somewhat (already part of the above debug output — only desire is visible). With this, the enemies move around a bit instead of standing frozen (looks broken) whenever they can’t go to where they want. 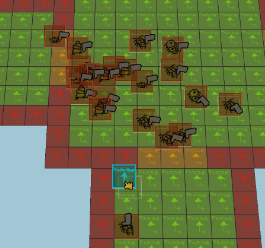 By now I’ve “played” the game hundreds of time now, tweaked a lot of numbers along the way, and the enemies are behaving pretty much close to what I imagine dumb smart AI to be. But I think it’s time I stop expanding the AI stuff for now. No one cares how it’s made as long as the results are as expected. I’ll tweak parameters further as I play it. But I will likely not expand until I need different AI types.